Lamberts Maxi-Hair is a comprehensive multi formula providing nutrients required for healthy hair. Healthy hair is an outward sign of health and this product provides 25 essential micro-nutrients to help you stay in optimum health. 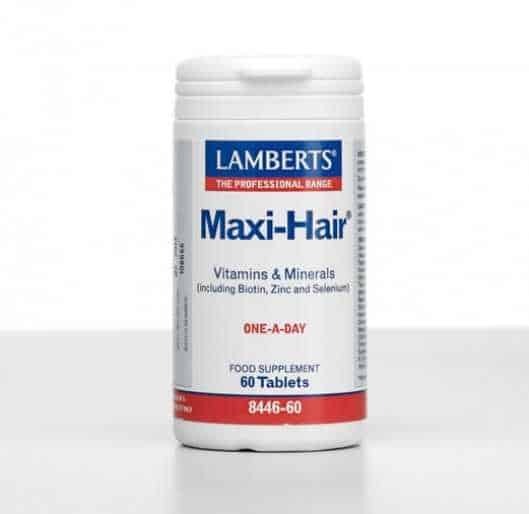 Lamberts Maxi-Hair contains a good spread of nutrients including the B vitamins and biotin which can help in the maintenance of healthy skin, hair and nails. The nutrients in Lamberts Maxi-Hair® are all presented at significant levels. In fact the level of B vitamins and magnesium exceed the amounts found in typical high street multivitamin and vitamin D is presented at twice the level of most A-Z products. Please note: Women concerned about thinning hair should take Florisene® product. One of the most common causes of hair thinning in women is caused by a simple deficiency and the clinically supported Florisene® formula is designed to address this.